Hi again! As promised in my previous post, here are the tutorials for my Snowflake and Tinseled Christmas Tree nail art tutorials using all F.U.N. Lacquer polishes from the December 2013 collection. You can see my swatches of all 6 polishes here. I found the easiest way to draw a perfect snowflake using a hexagonal glitter as the guide. If you recreate this look, don’t forget to tag @lacquertude and hashtag #lacquertude on Instagram and you can follow my account here, or post your photo on my Facebook wall. Paint 3 coats of Icy Snow and allow to dry to around 80% when the surface is still tacky but not easily dented. Fish out one piece of the largest hex glitter from Winter Wonderland. My trick is to just pick up the brush and spread it on a piece of wax paper or plastic bag. Then I can easily pick the glitter I want. Now, stick the glitter in the center of the nail. If you’re having trouble making it stick (ie. The base polish has dried completely), then just apply a thin layer of basecoat first. Now you can use the hexagonal shaped glitter as your perfect guide for drawing the lines of the snowflake. Using white acrylic or polish, draw a line straight from the top and bottom points of the glitter. Repeat step 3 and paint lines from the 45 degree angle points of the glitter. Repeat step 4 and paint lines opposite 45 degree angle points of the glitter. 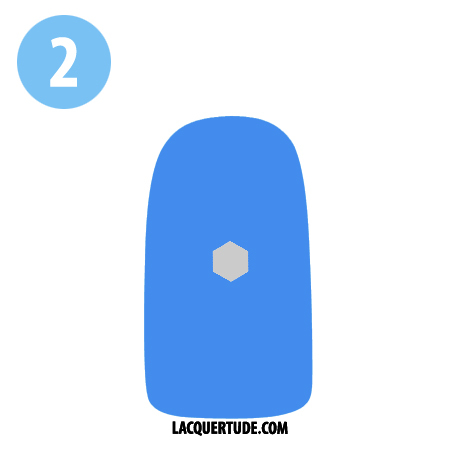 Now you can already see the base shape of your snowflake! Draw small arrows toward the glitter at the base of each line, leaving just a small gap. Draw 3 more lines, longest first, then shorter, then the shortest toward the tip of the snowflake. 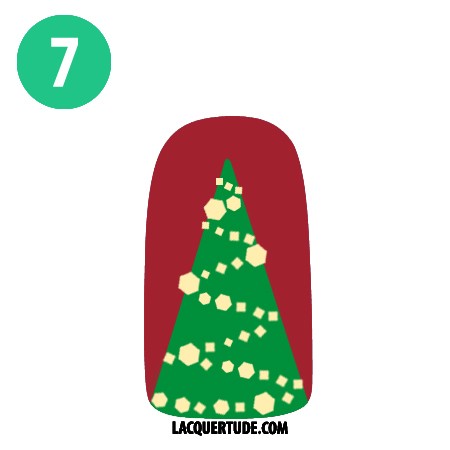 For this Tinseled Christmas Tree nail art, I used 4 polishes in total: DECENTber (red base), X’Mas 201Tree (green tree), Gold Mark (tinsel and gold lights), Wishing Star (star on top of the tree). Again, if you recreate this look, tag @lacquertude and hashtag #lacquertude on Instagram and you can follow my account here, or post your photo on my Facebook wall. Paint 2-3 coats of X’Mas 201Tree and let dry. I applied a thin layer of HK Girl Glisten & Glow to speed up the drying process. There’s never enough time in a day! Using striping tape, mask off a triangle, leaving just enough space on the top for a star later. Fill in the sides of the nail with DECENTber, taking care not to go over the striping tape lines. Immediately remove the tape and you have your Christmas tree all ready for you to decorate! Spread out some glitter from Gold Mark on a piece of wax paper or plastic bag (this is so that it doesn’t dry too quickly, allowing you more time to pick up the glitter and place them on your nails). Paint a thin layer of base coat only on the tree to make it easier for the glitters to adhere. Start from the top of the tree and place small glitters in a downward angle. Place more glitters in the opposite direction just like you would decorate a real tree. Mix in some different sizes of glitters to create the look of tinsel and Christmas lights/ornaments. Repeat step 6 till you reach the bottom of the tree. Using Wishing Star, draw a star on top of your tree (or you can use a star stud if you have one handy). Seal in your design with HK Girl Glisten & Glow and now you can dazzle your friends and loved ones with this festive Christmas tree on your nails! Well, I hope you enjoyed these wintry December snowflakes and Tinseled Christmas Tree nail art tutorials. Let me know if you have any questions in the comments and I will answer them as best as I can. What other Christmas nail art would you like me to try? Let me know down below as well. Have and wonderful week and remember to share your recreations with me via Facebook or Instagram! I really love your pictorials! Your nails are flawless, as usual! Wow! When I read your previous post I didn’t even realize you painted the snowflake – I thought it was a nail sticker or a water decal or some other stuff of this kind. Great job and a really nice tutorial! Beautiful job and very clear and understandable tutorial! Thank you for sharing!